PetPace, the developer of an innovative wearable tech, IoT collar for remote real-time monitoring and analysis of pet vital signs and activity, announces the initiation of a large, groundbreaking study of dogs with epilepsy, a common neurological disorder affecting millions of dogs worldwide. The goal of the study is to develop the capability to detect and possibly predict seizures in dogs. Despite the high prevalence of epilepsy in the pet population, clinically managing the condition remains a challenge, partly because the true frequency and severity of seizure events, in any particular dog, is rarely known. Since pet owners cannot watch their dogs constantly, and the dogs themselves cannot report such events, it is very difficult to assess the severity and extent of the condition, or response to treatment, in any individual dog. Likewise, the efficacy of drugs, or other treatments in real-life conditions, is hard to assess without detailed knowledge of seizure activity. The PetPace pet health monitor, capable of measuring a range of physiological and behavioral attributes, is currently being used in a large, international, multi-center clinical study to address this problem of seizure activity visibility gaps. During, before and after a seizure, it is common to see changes in pulse rate, respiratory rate, temperature, activity patterns, body postures, heart rate variability (HRV) and more. The PetPace smart collar accurately measures these parameters in real time, stores the raw data and makes it available for detailed analysis by researchers. In the current study, veterinary neurology specialists from universities and private specialty centers in the U.S. and other countries are collaborating to create the first-ever database of biometric information on dogs with epilepsy. Subsequently, advanced mathematical models will be applied to the database for the detection of specific patterns that will indicate and possibly predict a seizure event. Additional collaborations with multiple leading universities and private specialty hospitals in the U.S., Canada, U.K., and Israel are already underway, utilizing the revolutionary non-invasive, remote vital signs and behavior monitoring provided by the PetPace collar. 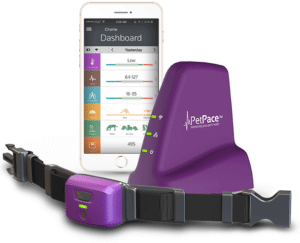 Additional areas of active research using PetPace collars include cardiology, behavior, pain evaluation, intensive care, rehabilitation, sports medicine, surgery (orthopedics and soft tissue), respiratory medicine, physiology and more.